Imagine waking up in some unfamiliar place, dazed and disoriented. You stumble downstairs to a charnel house of cadavers, finding one of your good friends chewing off another friend’s face. What would you do? This cognitive dissonance, this mammalian panic terror is the core of what makes Fear The Walking Dead so deadly effective, as well as what separates it from its mothership. AMC has been quick to point out that FTWD isn’t The Walking Dead. “It’s a family drama,” as creator Dave Erickson reminds us. 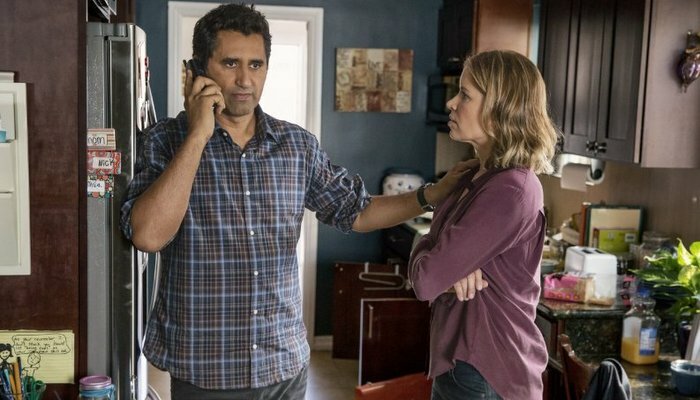 Fear The Walking Dead follows a family, The Clarks, during the first days of the outbreak that will eventually bring about the collapse of civilization. The Clark’s teenage son, Nick, played by Frank Dillane, is in a bad place. He’s a drug addict, a runaway. He’s the first to encounter the horrors, as he wakes up in The Church, a junkie shooting gallery, to a blood bath, finding his friend Gloria, “90 pounds soaking wet,” eating another junkie’s face. Nick freaks out, running into traffic and landing himself in the hospital. Nick’s mom, Madison, played by Kim Dickens (Gone Girl), is at her wit’s end. She’s afraid she’s going to lose her son, which occupies her focus, blinding her from the catastrophe that is rising around her. Nick’s sister Alicia, played by Alycia Debnam-Carey is the typical resentful put-together sibling, just counting her days until college, while still caring about her younger brother at the same time. And then there’s Madison’s boyfriend Travis, played by Cliff Curtis, who’s just trying to be strong and hold it together for Madison and her kids, if only to distract himself from his own estranged son. It is a family drama. We told you. 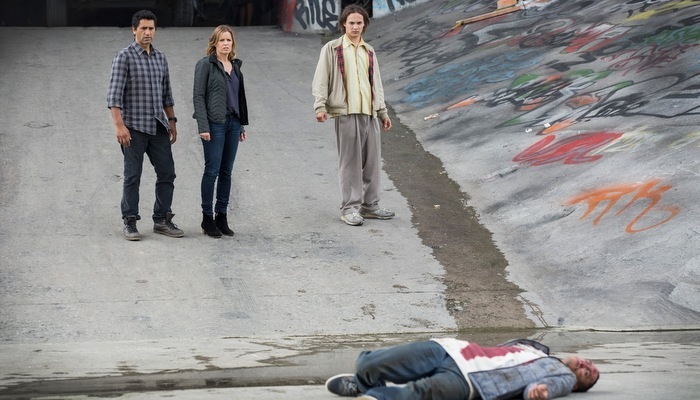 Anyone interested in a title containing The Walking Dead will be wanting to know, “What about the Walkers?” Fear The Walking Dead, however, is taking its time, ratcheting up the tension, building the mood. This is the beginning of the apocalypse, after all. ‘Pilot’ isn’t all mood-building, however. There’s a dramatic series of events that unfurls after Nick escapes from the hospital and tries to make sense of what he’s seen. Although a lot of viewers don’t like “this whiny drug addict,” I think Dillane’s character gives a human edge to The Walking Dead universe. The thing you must remember about horror is the creeping, lurking dread, that shuts down your nervous system like a field mouse in the hawk’s shadow. When confronted with viscera and death, the nervous system recoils and shuts down; the mind will even retreat into madness, if necessary. Life cannot comprehend its imminent demise, it’s too much to bear. When we encounter the vicinity of Death, in real life, it stops us in our tracks. It is a visceral, all-too-real experience. It’s also one you get used to, and sometimes quickly, as can be seen from the fact that any soldier has ever returned home sane and intact from a war, ever. These early stages of Fear The Walking Dead are a chance, to watch up close and in squirming detail, regular people attempting to deal with Hell On Earth. Random moments, like Madison being upset when she finds her son’s drug stash or Alicia counting the days until college, are rendered particularly poignant and potent, when taken in the context of what is to come. It’s a resonance that couldn’t have been possible with the original, when viewer’s connections with the universe were not so real and deep. This isn’t the only difference between the original and Fear The Walking Dead. FTWD is shot digitally, lacking the grit of the 16mm of the original. Film being used on a TV series is a bold, distinctive risk that has paid off, offering a unique grit and darkness that has served the apocalyptic series well. Shooting digitally automatically presents a cleaner, slicker, more modern look. This, in conjunction with the high school melodrama, leaves me to wonder if AMC are vying for a younger, hipper audience? If so, there’s nothing wrong with that. It’s working for Scream, so we’ll bite. And the last question which may be on your fangs is, “Is it scary?” Of course, this is what every horror lover really wants to know. The answer is: kind of. There’s some slight freak-outs, a fair amount of ichor, and a lot of tension. There’s also a lot of sadness, regret, anticipation, sarcasm, passive/aggressiveness, and many, many more emotional hues and shades, which bodes well for watching the human element of the End Of The World. CONCLUSION: AMC’s prequel to The Walking Dead starts off slow, building back-story and tension, but ends with a 2-ton impact that bodes well for things to come. Join us next week for continuing coverage of AMC‘s Fear the Walking Dead, Sunday’s at 9 PM. This entry was posted in Reviews, Television, TV Reviews and tagged Alycia Debnam-Carey, AMC, Cliff Curtis, Fear The Walking Dead, Frank Dillane, Horror, Kim Dickens, The Walking Dead, TV Recaps, Zombies. Bookmark the permalink.